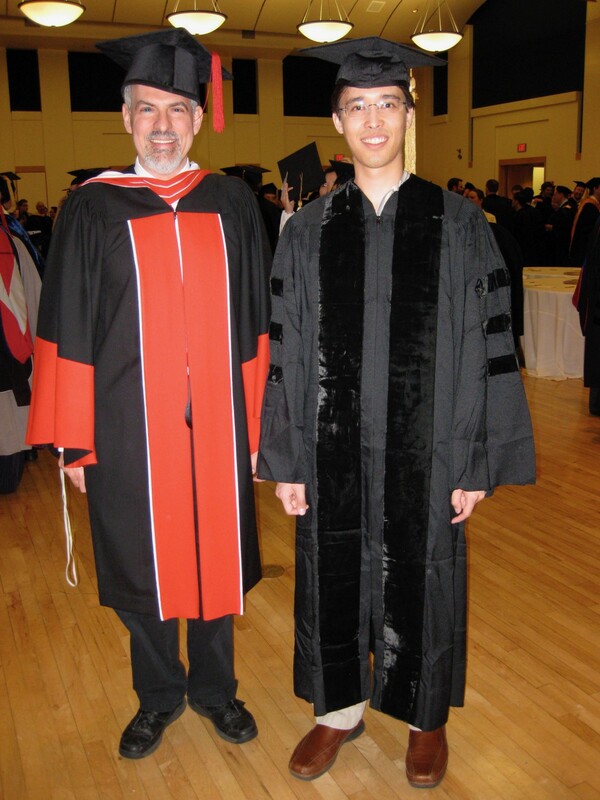 Me and my advisor, Brad Myers, graduating with my Ph.D. When I was an undergraduate, I stumbled into research mostly by accident. I was looking for a summer job, and an undergraduate research position in Dr. Margaret Burnett’s lab seemed way more interesting then setting up wifi in the dorms. To my surprise, research wasn’t just more interesting, but Dr. Burnett showed me a whole career that I’d never really considered: being a tenure-track professor. Every aspect of her job I learned about seemed fascinating to me: answering unanswered big questions about software, sharing the research community’s discoveries with students and the rest of the world through teaching, mentoring and guiding young people, and networking globally with a community of other people interested in sharing and debating ideas. This was my dream job. Within a summer of research, I was sold: I wanted to be a professor. Many doctoral students come to graduate school with the same goal that I did. And this isn’t too surprising: most undergraduates are exposed to research in universities, and most are exposed through encounters with tenure-track professors. If a student becomes attracted to research, they’re going to be partly attracted to the career of the mentor who introduced them to research. What’s not visible to most undergraduates, and even to most doctoral students, is the sheer number of other things that people do with doctorates beyond being a tenure-track professor. Evan Peck wrote about this recently, documenting his surprise in finding that there was more than just tenure-track professors and teaching track professors. He found all kinds of academic institutions that supported a different balance between research and teaching, and found a sweet spot that fit his goals of deep mentorship with undergraduates with balanced expectations of research productivity. Tenure-track professors at top-tier research universities. These are tough to get, and can be high-stress, high-reward positions, with high expectations of research productivity and impact, with possibly lower expectations of teaching excellence. I have one of these jobs, as do many of my friends and colleagues in academia. What’s uniquely exciting about them is being at the bleeding edge of research in a context that provides more intellectual freedom than any other context. Tenure-track professors at second-tier research universities. These have all of the same responsibilites, but with potentially more difficulty finding excellent students and less help from the reputation of a school. These downsides, however, come with an upside: they provide much greater access to students from diverse backgrounds, which can be great if one wants a substantial research focus, but also a stronger focus on student mentorship and teaching. It can also be a lot more fun to be at an underdog university, where every win is celebrated rather than expected. Soft-money professorships. These are more common in medicine and health sciences. They tend to come with all of the research expectations of the professor positions above, but with fewer or no teaching research responsibilities, and the expectation that one raises most or all of their salary through grants. Some of these are tenured positions others are not. The big upside of these is being part of competitive research-centered institutions with great scientists, but without the responsibility of teaching. Post-docs. Many doctoral students find positions in other labs conducting research independently and under the supervision of other faculty. These can be short term gigs, but some can also be longer, depending on how much funding there is. They can be a great way to build up a research record. Research scientists. Many people with Ph.D.’s are interested in doing research, but not teaching. Many universities will hire people into these “soft money” positions, expecting researchers to raise most of their own salary to support their research. While these can be grueling, requiring substantial fundraising, some people like it because of how entrepreneurial it is, and how collaborative it can be. Research staff. Some people with Ph.D’s don’t want to be the principal investor in charge of projects, but are happy to play a supportive role. For example, it is quite common for large projects to have support for multiple research staff, all of whom are key members of a research team. These jobs can be unstable, since they depend on research funding, but some love them for the variety of research contexts that they get to participate in. Tenure-track professors at top-tier teaching colleges. Just as Evan described, these positions come with greater expectations of teaching and mentoring excellence, with lower expectations of research output. This is an excellent choice for doctoral students who want closer relationships to undergraduates students, an expectation of excellent teaching, but still some focus on discovery. Lecturers at research universities. Without the promise of tenure, and no research responsibilites, many doctoral students look down upon these positions as failure. Nothing could be further from the truth: lecturers at research universities are often highly sought after and can be some of the best teachers in institutions of higher education. They may not have the same power as their tenure-track peers, but they are often fully entrusted with welcoming new students to a university in introductory courses, introducing a discipline’s biggest ideas at scale, and shaping the undergraduate culture and experience. Lecturers at teaching universities. These positions have no expectations of research, and are in colleges where little to no research occurs. These are an excellent choice for doctoral students with a passionate for great teaching and mentorship, without the distraction of discovery. These can be tenure-track or non-tenure track. Teachers at community colleges. Most doctoral students don’t even think about this as a possibility. And yet, if you truly want to make an impact on lives, teaching small classes to incredibly diverse students across age, gender, race, and income, is the best place to do it. Many of the community college teachers I know are some of the best teachers I know, and don’t get nearly the credit they deserve for changing people’s lives through learning. Teachers in K-12. Most doctoral students I know haven’t ever considered K-12 teaching, public or private, as an even remote an option. In the United States, the low pay, the long hours, the pressure from parents, and the scant resources don’t help. But there are numerous countries in the world where this isn’t true, and even in America, teachers can be pivotal mentors in thousands of students lives. If you want to help guide and develop future generations with the expertise you’ve gained, this is the place to do it. Academic administration. Some doctoral students simply love school and it’s institutions. Many people with Ph.D’s stay as administrators of academic programs, of diversity programs, of student recruiting and admissions programs, and the vast number of other roles it takes to run colleges and universities. This are exciting because they’re at the heart of making academic institutions productive and impactful. Industry research labs. Most research in academia looks far out into the future, sometimes decades, sometimes centuries, and sometimes into infinity. If that frustrates you, industry research labs can be great places to look two to three years out instead, bringing the latest discoveries from basic research into practical discoveries that can shape products, services, and policies. Some of the best labs (e.g., Microsoft Research in computing) can even provide a substantial amount of intellectual freedom, offering a career with a focus on research and business impact, without teaching. Industry R&D. In contrast to research labs, research and development (R&D) is more about applying research discoveries to practice. For example, one of my doctoral students, Brian Burg, took this route, taking the expertise he developed as a doctoral student directly to Apple, helping to develop well-understood innovations into products. User experience and data science. People with all kinds of Ph.D.’s help companies understand product opportunities by applying research methods and informing business decisions. Anthropologists, sociologists, information scientists, statisticians, and a wide range of other people with Ph.D.’s can apply all of the research methods they’ve learned to shaping what businesses make and sell. Engineering. In contrast to R&D, engineering jobs aren’t about exploring new products, but about shipping and maintaining products. For some people with Ph.D.’s, this might be frustrating, since the pace of work requires leaving so many questions about a product unanswered, but for many, the most direct way to have impact on the world’s products and services is to apply it directly to the marketplace. If one cares deeply about impacting the world through research discoveries , this is the best way to have it. Management consultants. Businesses are constantly looking for strategic advice to help them make better decisions, react to new technologies, and make organizational change. Depending on what a business wants to achieve, a Ph.D.’s expertise and ability to provide clarity around complex ideas can be invaluable. These positions can be fun because they expose people to a broad diversity of organizations without the burden of a long-term commitment. Entrepreneur. Some Ph.D.’s take their expertise and discoveries into the market, seeking angel funding, venture capital, and other source of investment to make their ideas into products or non-profits. This is an excellent way to express and implement a vision in a way that established organizations simply cannot support. Some Ph.D.’s do this as founders, others join early startups to help shape their trajectory. Non-profit executive. Many non-profits have such focused goals, a Ph.D. in a certain area of expertise that matches those can be an excellent fit. This allows one to focus on solving a problem in the world without having to have decisions warped by the profit motive. SBIR Contractor. The United States offers gap funds to bridge basic research and product design, funding the search for an application of basic research to product. Many Ph.D.’s work as contractors for these 1 to 2 year projects, helping to find useful applications of basic discoveries. Policy research. Research can also be applied to law, shaping the rules that govern society. For example, one of my graduate school colleagues decided he wanted to stay in Pittsburgh after graduate school and took a job at the RAND corporation. RAND does contract research, often with the U.S. congress, to help shape and inform policy decisions. My colleague’s first project was helping to assess the impact of the No Child Left Behind act. Science funding and policy. Many academics later find careers at places like national funding or policy agencies, such as the National Science Foundation in the United States. These jobs can be can excellent way to have impact on how humanity does and doesn’t invest in science over time. Not only are these great positions of power, but they can expose one to the interaction between discovery and our civic lives. Government labs. There are many parts of many country’s governments that require expertise of all kinds. A few examples in the United States are the National Institutes of Standards and Technology or the National Security Agency. Many Ph.D.’s join the government to offer this expertise, serving their country. Science writing. Many people with Ph.D.’s can apply their expertise to writing about their discipline’s discoveries. This might be in the form of popular books, as science journalism, or as experts in media. These jobs are fundamentally another teaching role, but for teaching the world broadly, outside the context of school. Expert witness. In many legal contexts, a prosecution or defense needs someone with expertise to help explain complex ideas to juries and judges. I have colleagues with Ph.D.’s who’ve made their whole career testifying in cases, and they often get paid handsomely to do it. I’m sure I missed all kinds of other interesting careers. (If there’s a glaringly obvious one, write me, and I’ll add it). I really don’t view any of these jobs as more or less important to society. We need every single one of these roles in society, and high-productivity research roles are just one of them. I try to make sure every one of my doctoral students understands that all of these are possible. Hopefully this list is a useful resource for students and faculty who have the same goal.